A domain is the address of your website. Before you can set up a website, you will need a domain. To own a domain name, you need to register it with a domain registrar. Domain name is not something physical that you can touch or see. It is a string of characters that give your website an identity (yes, a name, like human and businesses). Examples of domain name: Google.com, Alexa.com, Linux.org, eLearningEuropa.info, as well as Yahoo.co.uk. All domain names are unique. This means there can be only one alexa.com in the world. You cannot register a name once it is registered by others. Most domain registrars nowadays also offer web hosting services. Most hosting companies have the facility to register a domain name for their users. Some companies even offer a free domain with the purchase of hosting package. Namecheap is a solid choice for registering your domain name. Plus, their site is incredibly intuitive and easy to use, especially on their domain management pages, which can be incredibly helpful. They offer reasonably priced domains and have a free DNS service, and WHOIS protection. They also offer SSL encryption, for those looking to beef up the security of their domains. HostGator is a great place to register domains, no matter where you’re at on your online journey. Beyond registering domains they’re mostly known for their hosting. They also offer low-priced hosting and domain registration bundles. If you do purchase a bundle package and decide to get hosting as well, then you’ll be happy to hear that they have a 99.99% uptime, meaning your website will very rarely, if ever, go offline. Plus, the current host over 9 million websites on their platform. HostGator provides a solid foundation for you to start your online journey. GoDaddy has been around for a very long time. They’re a domain registrar and a hosting company, so they can do a lot for your site without you having to turn elsewhere. 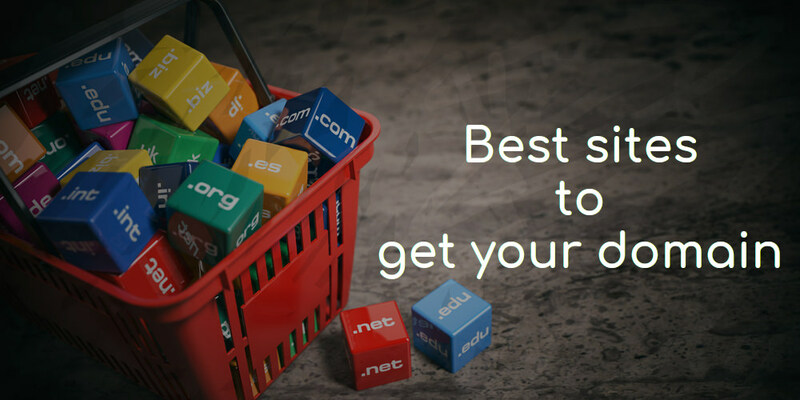 They are the world’s biggest domain name registrar and they also sell a lot of other services to support larger sites, eCommerce sites, and much more. GoDaddy does offer a great service, but their design and ability to use the service could be improved. You can get the things done you need to get done, but you’ll have to wade through constant upsells of other products and services and their cluttered layout. Overall, they do offer stellar phone support, if you’re one of those people who would rather speak to a person, than email. And their chat support is simply okay. Bluehost is well known as a web host, they’re typically regarded as one of the best hosts for those just getting started online. But, they also let you register domain names as well. If you’re planning on purchasing hosting at the same time you register your domain name, then Bluehost might be a good fit for you. When you purchase one of their hosting packages you’ll actually be set up with a free domain name. So, if you need to purchase hosting and a domain at the same time, this could be a way to save a little bit of cash. Bluehost has a stellar support team and are available 24/7, 365 days a year. A lot of people end up choosing Bluehost due to their support alone. Hostinger has been around for years. A well-established web host and domain registrar, Hostinger attracts 15,000 people a day to its brand, selling hosting and domain names. If you fancy going for a less well-known domain extension like .xyz or .tech, then you can get these domains from Hostinger. Established in 2004, Hostinger now has over 29 million users, collectively with its subsidiaries in 178 countries. The company uses cloud web hosting technology and provides hosting with MySQL, FTP and PHP. Hostinger is a parent company of 000Webhost, Niagahoster, and Weblink. Dreamhost was founded way back in 1997. Today they’re a full-fledged hosting provider and domain name registrar. They now host over 1.5 million websites and have over 400,000 customers. If you’re looking for a domain name registrar that also offers to host, then Dreamhost might be a good choice for you. Dreamhost has a host of cool features, like, having a nearly unlimited supply of domain name extensions, offering free domain privacy, easy control over your domain’s settings, and as a plus, they’re an environmentally friendly company. Hover officially launched in 2009, but it’s an offshoot of Tucows Inc., which is the third-largest ICANN accredited registrar online. Hover is essentially a merger of three big players in the domain registrar space. Hover is great in that they’re incredibly straightforward. They offer domain registering and that’s it. For that reason, it’s very easy to register a domain with them, because that’s all they do. You won’t be bombarded with endless upsells and advertisements for other services of theirs. The process of setting up your domain names is also quite seamless and their backend is quite nice to use. Since they just focus their service around this one thing there support is also excellent, and you’ll always have a real person handling your request. Flippa is different from the rest of the registrars on this list in that they’re primarily a marketplace for buying and selling domain names and websites. However, they also have a ton of domains for sale, sometimes for less than a dollar. However, this can be a great way to start your online journey. Especially if the domain you’re purchasing already has a strong backlink profile to give you a boost in the search engines. Once you purchase a domain from Flippa you’ll need to register the domain with a new registrar and choose a host as well. Depending upon the details of the sale and where the current domain is registered and hosted. 1&1 is another domain name registrar that’s been around for an incredibly long time. They currently manage around 19 million domains across the globe. As another bonus, they don’t tack on any additional ICANN fees or private registration fees, so the prices you see are the same ones you’ll see during checkout. Beyond being a domain name registrar they also offer web hosting, a website builder, eCommerce solutions, and even email hosting. Name.com is another long-time player in the domain registrar space. Beyond offering simple domain registration they also offer tools like hosting, email, and even a DIY website builder. So, if you’re looking for a great place to take care of all your website needs at once, then this could be a great choice. One cool feature is their built-in search interface, which will automatically enable you to see which domain extensions are currently available for your chosen domain. They do have add-on services that they will upsell you with, but luckily these aren’t as invasive as other sellers. Their support is not 24/7, so hopefully, if an issue does arise with your registrar or hosting, it falls within their support window. They also only offer free WHOIS Privacy protection with the use of a coupon. Network Solutions is a very flexible domain registrar and hosting provider. They’re very flexible and can mix and match hosting and domain solutions to fit your needs, so if you have a unique circumstance, or require something very custom tailored, then they’re worth checking out. Their support is also available 24/7 and is extremely tech-savvy, so they can easily solve your most pressing issues. Domain.com offers the cheapest domain names registration service. They are one of the popular choices for domain registration. Domain.com has a lot to offer given its low price. At this moment, Domain.com offers the following payment option: PayPal, Visa, MasterCard, Discover, American Express. Gandi was founded way back in 1999, which in Internet years makes it about 100 years old. Currently, the company offers over 350 different domain extensions and manage over 1.5 million domain names worldwide. They’re great in that you don’t have to worry about being sold on additional services you aren’t looking for. Their business plan is to offer the best possible domain registration experience for the most reasonable price possible. Gandi is also very upfront about their pricing. They give a clear breakdown of the varying pricing levels and what each level of service entails. If you’re looking for a hosting company that’s as straightforward as can be, then Gandi might be the right choice for you. Enom, Inc. is a domain name registrar and Web hosting company that also sells other products closely tied to domain names, such as SSL certificates, email services, and Website building software. As of May 2016, it manages over 15 million domains. Enom was founded in 1997 in Kirkland, Washington operating as a wholesale business, allowing resellers to sell domains and other services under their own branding. Enom also operates retail sites enomcentral.com and bulkregister.com. iPage is a web hosting and domain registration company owned by the Endurance International Group. They offer a wide range of web hosting solutions for online businesses and webmasters to create websites. iPage offer one of the cheapest and low-cost shared web hosting packages which are highly suitable for small sites. They also offer a drag and drop based site builder that helps non-techy users to create a website without any coding knowledge. iPage was initially founded in 1998 as a full web service provider, but the company completely re-launched operations as a web hosting provider in 2009. It's currently run by Endurance International Group, which is also the owner of other web hosting companies such as BlueHost and HostGator. A2 Hosting is a quality Linux Hosting company. They offer affordable VPS, shared, reseller and dedicated hosting solutions. They are steadily growing and take pride in Their ability to offer top-notch, real support from the customer service team that called the Guru Crew. Another aspect that sets them apart from their competitors is their aptitude for remaining on the cutting edge for the technologies that support (including PHP, MySQL and many more). Many web hosts seem identical on the surface, offering disk space, bandwidth, email, site builders and 24x7 support... but these are only a fraction of the benefits you'll enjoy when you host your website with Just Host. Get your very own professional domain name for a year with all hosting. You can set up unlimited email addresses at your own domain. Autoresponders and forwarding included. Hostwinds remains a user-friendly option for registration and hosting, even if you're transferring from another service. It lists out all the extensions to create your domain name with prices to register, transfer, or renew for each extension, unlike some services that bury these within the website. You simply enter the domain name you want and check the availability, and can theoretically get going in a few clicks. Sedo is where I bought my domain - over Escrow - and is a global marketplace to buy, sell, and park domain names. They've over 18 million domain names for sale, but the big part is that they're a huge, well-respected company. Create a professional website yourself: no expensive programmers or designers required! You get all the basic email accounts that you need, but if you want more, simply switch to their Business or Business Pro web hosting plans; or get an awesome cloud-based business grade solutions. Register.com was founded in 1994 and is headquartered in New York, NY. The company is owned by Web.com Group Inc., which is an American domain name and web development company. Register.com currently manages over two and a half million different domain names. Features and products include domain transfers, website, and e-commerce site builders, hosting and SSL options, email services, and online marketing tools. Online marketing tools include search engine optimization (SEO), pay-per-click advertising (PPC), Facebook Boost, and more. Customer support options are available by phone and email for all departments. However, there doesn’t seem to be a live chat option. It’s never been easier to set up and create a website, especially if you use a Content Management System (CMS) or website builder. You can’t avoid the need to register a domain name. You can’t register a domain name without a domain registrar that takes care of the back end of the website registration process. If the domain name system didn’t exist, we’d have to navigate the internet by entering in long, difficult-to-remember IP addresses. Choose the domain name and domain registrar as you prefer. Share your thoughts with us regarding domain hosting. Thank you!